Chucklefish (publisher of the popular Stardew Valley) has finally announced its new game. Its name is Spellbound Witchbrook and it is a wizarding world school sim. 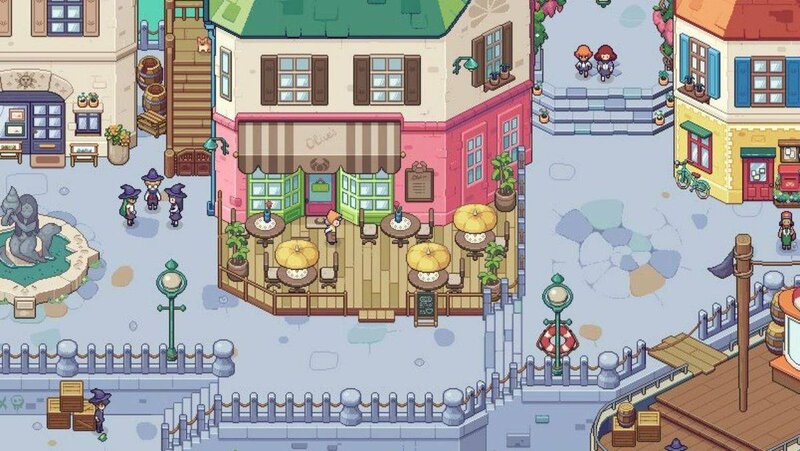 UPDATE: Finn Brice has recently tweeted out that the official name of the game is now Witchbrook. This article has been updated to reflect this. Finn Brice (founder of Chucklefish) who has been teasing us about a “Stardew Valley meets Harry Potter” game ever since September 2017, did an interview with Damien McFerran of RedBull.com to finally shed some light on the game. When one first hears the words “wizarding world”, one would typically think of non-other than J.K. Rowling’s Harry Potter. Even among is worldwide popularity, there has never been a true Harry Potter / Hogwarts wizarding school sim game. There have been games where this was a small part, but not where the game revolves around this idea. Even the new mobile game Harry Potter: Hogwarts Mystery is going to be more of an exploration and mystery puzzle solving game than a straight sim. While Brice explains that Harry Potter was the direct inspiration; they wanted to create a magical world that is very much unlike Hogwarts. Whereas the magic that exists in the world of Witchbrook will be very practical. Drawing inspiration from Terry Pratchett’s Discworld and Garth Nix’s Old Kingdom series. Brice also mentioned getting inspiration from Studio Ghibli animations and Steven Universe from Cartoon Network. Chucklefish is hoping that with their experience from Stardew Valley, Witchbrook will cast its own spell on gamers. As with any school, in games or in real life, you will have a wide range of assignments and events when you finally enroll in Witchbrook. Much like in Harry Potter, your time in Witchbrook centers around your classes, the relationships you build, and the magic you will learn. “Players should expect to build up their magical proficiency by undertaking school projects. This might have them growing magical crops and creatures in herbology or taking on the denizens of the forest in elemental magic. School life is just as important as magic, however; a lot of time will be spent meeting and befriending the varied cast of characters, taking on quests, awkward attempts at dating and a host of side activities.” Brice explains. He wants the player to feel like they are just a small part of the living and breathing world that is Witchbrook. Not just in a game that revolves around them. The combat in this game will be very much like a retro Zelda-like action RPG. With spellcasting taking the place of swords and bows. Players will be able to unlock and combine elements to create new and exciting spells. Witchbrook currently has no release date but is heavily in development. No word on platforms besides PC; but do not rule out the Nintendo Switch, Brice mentions. The charming art style definitely will lend itself well to the premise. I can’t help but notice three curiously familiar witches in the screenshot below from a certain popular magic school anime. What do you think of Witchbrook? Sound off in the comments!